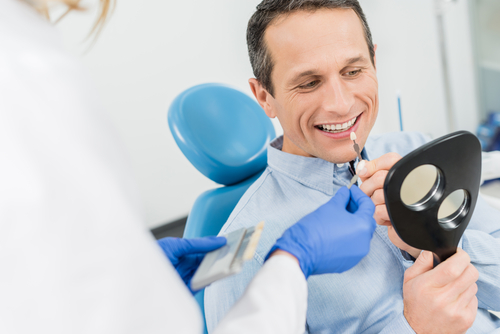 When it comes to enhancing the way your smile looks, there are numerous options to choose from. Two of the most popular choices include cosmetic veneers and porcelain crowns. But depending on your oral health needs, one may be more appropriate than the other. The smaller size of veneers means they only provide aesthetic benefits, not functional ones. If a tooth has moderate to severe structural damage, a veneer won’t be appropriate. There needs to be enough healthy tooth structure underneath to support a veneer. Crowns allow you to combine cosmetic materials and restorative techniques to protect damaged, decayed, or broken teeth. When a veneer won’t provide structural support, crowns add extra protection. They can be used to repair teeth with large cavities, root canals, or even placed on top of dental implants to replace missing teeth. A crown is a functional restoration that covers the entire portion of your tooth. As such, it’s necessary to trim down the enamel so that the crown can slip over it. For a tooth without any structural damage, this can compromise otherwise healthy enamel. If minor aesthetics are a concern, it’s best to opt for something less invasive. Book an exam and Wyndham Dental today to find out which restorative or cosmetic dental option is right for you. Our Wyndham dentists are happy to answer any questions that you have!